SS 904L Tubes, 904L Stainless Steel Pipes, SS UNS N08904 Pipes, ASTM A312 Stainless Steel WRN 1.4539 Seamless Pipes & Welded Tubes Supplier & Exporter in India. 904L is a non-stabilized low carbon high alloy austenitic stainless steel. We offer SS 904L pipes & tubes in different sizes, grades, diameters and types like seamless, welded & fabricated. 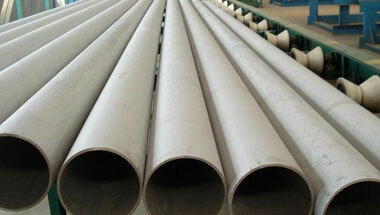 904L Steel Pipes & Tubes is a non-stabilized low carbon high alloy austenitic Stainless Steel pipe. The addition of copper to this grade gives it greatly improved resistance to strong reducing acids, particularly sulphuric acid. It is also highly resistant to chloride attack - both pitting / crevice corrosion and stress corrosion cracking. 904L grade is non-magnetic in all conditions and has excellent weld ability and formability. 904L austenitic structure also gives this grade excellent toughness, even down to cryogenic temperatures. These Stainless Steel 904L Pipes and Tubes are used in different application industries use in food industries, chemical industries , electrical industries, generator industries, shaft industries, cement industries, gas industries, power projects. Our product includes tubes and pipes, SS 904L Pipes, SS 904L Tubes, Stainless 904L Seamless Pipes & Tubes etc. These products are available at best possible prices which is another important feature exhibited by our products range. Stainless Steel 904L ERW Pipes, SS 904L Seamless Tubes, Steel 904L Welded Pipes, Stainless Steel 904L EFW Tubes, Stainless ASTM A213 904L Seamless Pipes Manufacturer in India. Cameroon, Canada, United States, Germany, Uganda, Ghana, Brazil, South Africa, Venezuela, UK, Turkey, Iran, London, Indonesia, Kazakhstan, Egypt, Jordan, Saudi Arabia, Kuwait, Democratic Republic of the Congo, Australia, Thailand (Bangkok), Nigeria, Mozambique, UAE, Bahrain, Ethiopa, Russia, Colombia, Morocco, Peru, Vietnam, Israel, Algeria, Africa, New Zealand, Argentina, Sri Lanka, Tunisia, Trinidad and Tobago, Sudan, Azerbaijan, Chine, Angola, Houston, Dubai, Italy, Iraq, Mexico, Malaysia. Cairo, Ouagadougou, Abidjan, Freetown, Nairobi, Amman, Pretoria, Antananarivo, Jeddah, Data from the UN, Alexandria, Dammam, Soweto, Dakar, Rabat, Bulawayo, Zaria, Dar es Salaam, Colombo, Casablanca, Cairo, Benin, Mogadishu, Byblos, Port Elizabeth, Bamako, Maiduguri, Port Harcourt, Singapore, Kampala, Dubai, Fez, Muscat, Johannesburg, Manama, Mbuji-Mayi, Lagos, Kaduna, Addis Ababa, Accra, New York, Tehran, Brazzaville, Jerusalem, Cape Town, Harare, Omdurman, Abu Dhabi, Beirut, Algiers, Luanda, Kolwezi, Conakry, Ibadan, Lubumbashi, Mecca, Giza, Maputo, Hong Kong, Doha, Kinshasa, Tripoli, Aqaba, Sharm el-Sheikh, Subra al-Haymah, Kano, Bethlehem, Tel Aviv, Yaoundé, Riyadh, Istanbul, Lusaka, Durban, Douala, Khartoum.